They're bigger and sweeter this Autumn! Plenty of rain and sunshine has resulted in an extra sweet autumn crop for Australian papaya and papaw, with record-breaking numbers forecast this season. Autumn marks a key peak for the unique tropical fruit, and thanks to its increasing popularity, new plantings will see crop numbers soar. Third generation papaya grower, Daniel Mackay, is happy with the sweet autumn crop hitting stores. In addition to their tropical taste, both fruits boast a wealth of health benefits, which according to Accredited Practising Dietitian and Australian Papaya ambassador, Caitlin Reid, makes it a great choice to help keep your family healthy. Perfectly paired with a squeeze of lime, fresh papaya and papaw are also a delicious addition to smoothies, muffins, or your morning muesli. They can add a refreshing contrast in savoury dishes like curry and when served as a side salsa, their digestive enzymes help to tenderize meat and fish. 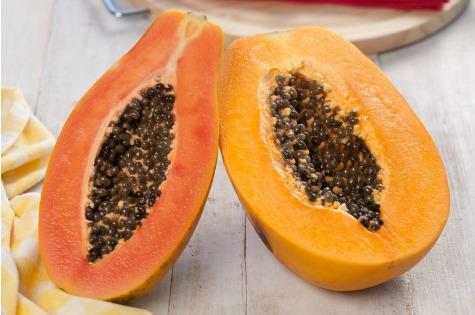 Strengthen your immunity: One serve of papaya or papaw contains double the RDI of vitamin C, which increases antibody activity and resistance to infection. It also helps release iron from foods. Eat the rainbow: Papaya's vibrant orange hue comes from carotenoids, powerful antioxidants, which have been associated with the reduced risk of several chronic health conditions including age-related eye disease and heart disease. Glowing skin: The carotene and vitamin C in papaya and papaw help to ward off free radicals like smoke, tobacco and stress. The unique bundle of antioxidants and water content in papaya and papaw also assist with skin elasticity and hydration. Papaya and papaw are 90% water! The two fruits can be distinguished by their colour, shape and flavour. Papaya is usually pear shaped with red flesh and a sweeter flavour, while papaw is usually round, with yellow flesh and is less sweet. Available all year-round, the best time to enjoy papaya is during its peak of autumn and spring, with plenty of great quality fruit on the market at a good price. A delicious recipe for the last weekend of summer!